Description: This is a small Original Little People Fire Engine play set that includes a small fire engine and a fireman. The fire engine has a small extension ladder on the back. The fireman has plastic arms that are designed to hold a fire hose, but this set was never sold with a fire hose. IPP - Black body fireman with freckles, white arms, and a white fireman hat. *See Variations below. LPP - The fireman was seen without freckles in the 1989 dealers catalogue. Fire Truck Variations - The Fire Truck came in both Dull Red and Bright Red. 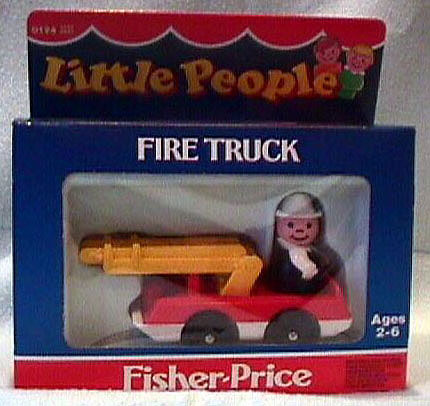 All first Fire Trucks came with wheels marked "Fisher-Price Toys". FP124SET1978 - (Complete set in blister pack) - This set was first introduced in 1978, sold in a 5-1/2" high x 6" wide blister pack, but was marked #123. It didn't receive it's individual part number until 1979. A boxed Fire truck set marked #123 is very rare. FP124SET1979 - (Complete set in blister pack) - This set was sold in a 5-1/2" high x 6" wide blister pack marked "124", and was also available in #123 Play Family Vehicle Assortment. FP124BOX1985 - (BOX ONLY) - 7-1/8" long x 2-9/16" deep display box marked "0124". FP124SET1985 - (Complete set in unopened box) - This set was sold in a 7-1/8" long x 2-9/16" deep display box marked "0124", and was also available in #2350 Little People Vehicle Assortment. This set was also sold in other countries, the French version is shown in the upper photo.